Science fairs and festivals are one of the platforms where scientists and engineers share their endeavours, cutting edge technology and the latest exciting research findings with the general public. The aim is often to engage the public to enhance their understanding of science, but also to inspire the next generation of scientists and engineers. I have previously participated in many such events both in the UK and the USA, either as an active participant or as an observer, and often think how realising similar inspirational events in Algeria is a necessity but currently seems to be a far fetched dream. It is sometimes easy to write and complain about the situation of science in a society, the real challenge is to contribute towards alleviating its problems. While we look forward to a day where we see high profile science events taking place on occasions like April 16th, it’s important to remember that there are intermediate steps that can be, or rather need to be achieved in the meantime. The role of science clubs is vital in this regard. I remember when I was still at school how April 16th, a day that has come to be known as the Day of Knowledge or as some may call it, the Day of Science, was celebrated almost every year with a typical program: A characteristic list of events such as students performances, poetry recitations about knowledge and success, and competitions and rewards for the achieving students. My experience of this year’s April 16th was different. 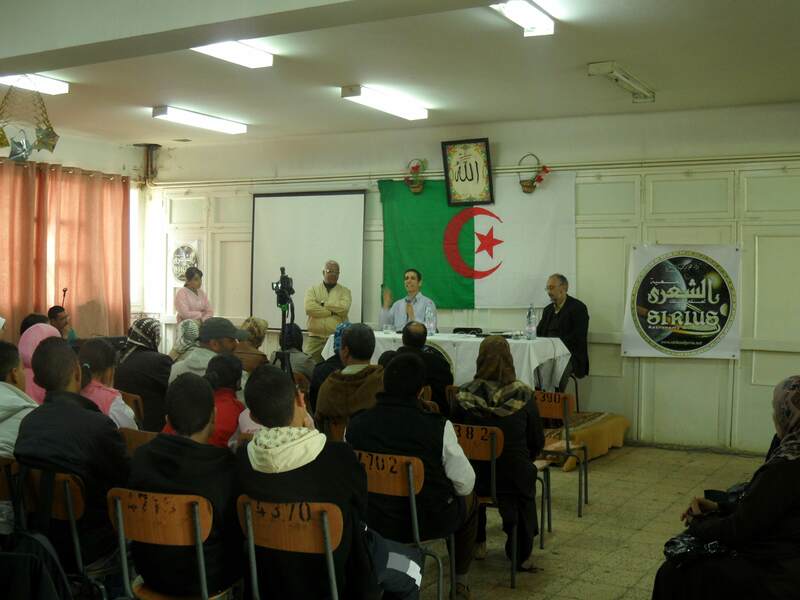 As an Algerian scientist based abroad, I was invited to take part in a series of events in the city of Constantine. The events were organised by the Constantine-based Sirius Astronomy Association, a science club that aims to promote public engagement of science. I had first heard about this association when I was in middle school in the late nineties of the last century. I have now been working with them directly on different projects (see for example the Astronomy Picture of the Day Arabic project), and the more I work with them, the more I am impressed by the range of activities they do, that up to then, I always thought could not be achieved given the difficult bureaucratic systems in Algeria that we are all aware of. 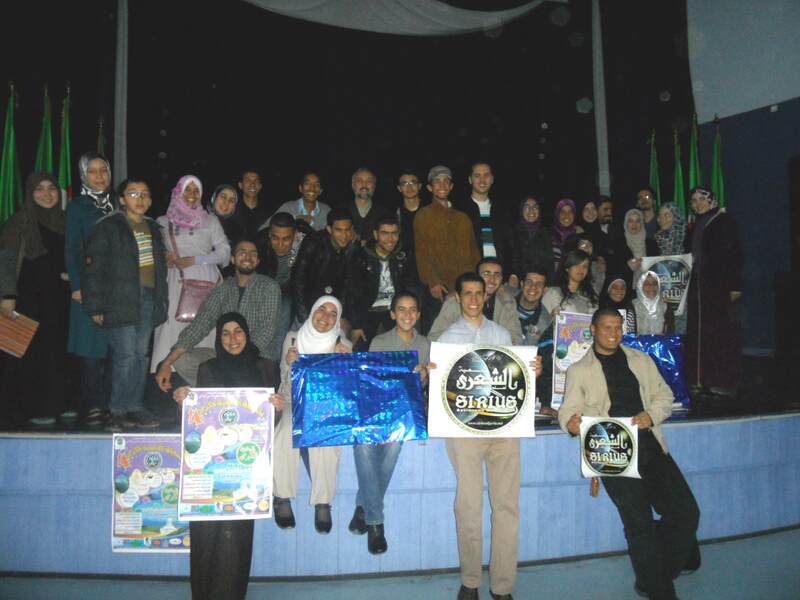 Members of Sirius Association at the ‘Great Science Competition’ ceremony. The first event I participated in was talking live on a local Radio station. Nadi Al-ma’arifa (The Club of Knowledge) is a Radio show that covers science news and events that first came on air in 1997 and has been airing live every Friday since. During the show, we talked briefly about my personal experience going from an Algerian school to obtaining a PhD from the University of Cambridge in the UK, and discussed the important place of science and scientists in society and the role of Algerian scientists abroad and how best they can benefit the country. The message I tried to convey through the discussions was simple: to strive to be positive. This is one of the show’s main messages, but I tried to emphasize it for a simple reason. One of the striking things that one notices when visiting Algeria from abroad is the discourse of despair: ‘You will not change anything…’, ‘They won’t let you change anything…’, etc. Although discussing the underlying reasons behind these attitudes is not what I intend to do here, the lack of exposure to success stories and successful role models who interact directly with the public, in addition to the absence of a wider science and technology strategy, are but a few of the reasons that nurture such negative outlooks. If radical change is required, having a positive attitude is a necessity. Maintaining a science show under difficult circumstances for fifteen years, for instance, is a praiseworthy achievement. Consider this anecdote: As soon as we finished airing the program, an editor in the same station approached me to record another program, but this time his invitation had nothing to do with science. The Algerian media in that week was overwhelmed by the news that the first president of independent Algeria had passed away. I was asked to record a program about the late president. I was surprised, but quickly realised the aim behind this invitation was about delivering a propaganda message rather than anything else. I declined. And while I am sure they managed to achieve their aim without me, this incident, despite its simplicity, highlights how some (or possibly many) of the media shows are run. A top-down propaganda message that has to be delivered often ends up killing the creativity of journalists and editors. On a later day, I had a program in a local secondary school, which was the best performing school in the whole of the Constantine district. The reception was bigger than I expected. The most exciting part for me was interacting with the students after having given a short talk on how the seemingly useless science and math lessons students learn in school are applied in advanced research. The aim of the school visit was also simple: Continuing the hope message by having the students interact directly with an Algerian scientist who, just a few years ago, was a student like them. Along with Sirius Association and the school, we wanted to expose the students to individuals who were educated in Algerian schools then went to continue their education in world-class universities and take careers in science or engineering. Bringing role models to schools is not new for Sirius Association. In a previous year, they hosted the Malaysian astronaut Muszaphar Sheikh Shukour, who was the first Muslim to go into space, as well as many other scientists from around the world. For the students, interacting directly with role models who were once in their shoes will no doubt give them an inspirational impulse, and hopefully counter the sweeping negativity they tend to be surrounded with elsewhere. The message is not necessarily whether to leave or stay in the country, but rather to aim high and work towards one’s dreams and the wellbeing of one’s society and community. For the general public, there is no better place to address a large number of people than the mosque. The relationship between the mosque and the general public in regards to development in general, and science in particular is indeed an interesting one. Ibn Badis, whose life and achievements we celebrate in the Day of Knowledge, used mosques to target the masses that could not be accessed through schools and youth clubs. Today, the situation is different in many respects. Not just as a result of the bureaucracy surrounding the organisation of events in mosques and the state control, but also the presence of social media and its influence on the youth in particular, which nowadays could easily dwarf the relative efficiency of mosques when targeting this group of the population. Nonetheless, mosques remain part of the local heritage, and their contribution can be significant in achieving an intellectual revolution similar to that achieved by Ibn Badis and his reformist movement that was initiated in nineteen twenties and thirties. Despite the lack of large-scale studies on the public understanding of science in Algeria, the perception of science in the minds of the public tends to be shallow, which is not different from developing countries in general and Muslim societies in particular (see for example the discussion in Nidhal Guessoum’s Islam’s Quantum Question). I was pleased with the level of interactivity and discussion that was generated after finishing my talks, which were entitled ‘an invitation to explore the universe’. However, I received many questions related to conspiracy theories about science in the west, and the so-called ‘I’jaz ‘ilmi’ (scientific miracles in Qur’an and Sunna) which tends to be a very popular topic whenever science is mentioned in Muslim countries. The I’jaz discourse is unfortunately often based in many respects on ill-understanding of how science works, as well as poor interpretations of the religious texts themselves. Discussing these issues is beyond the scope of this short report, but they further indicate the need for science events and science clubs to tackle widespread misunderstandings. In my final stop, I was invited to attend the fourth edition of Sirius Association’s ‘Great Science Competition’ where winners were announced and prizes were awarded in the final ceremony. This is a competition amongst students at high school level on science topics, which encourages students to go beyond taught curriculums. The prizes are very tempting too. This year’s winners will have the opportunity to visit a large space observatory in the Canary Islands, and previous years’ prizes included visiting China to see the solar eclipse of the century, and visiting the European Space Agency headquarters. For the students, these are their dream trips, and thousands of students in the Constantine district participate every year to explore and showcase their talent and creativity for a chance to win a prize. Such activities are very important in encouraging students to look for science beyond their locality. Working directly with Sirius Association, I came to realise the importance of such science clubs. We sometimes let our dreams go far in envisaging the establishment of science infrastructures in Algeria, forgetting the intermediate steps. Promoting sound understanding of science in the public is an important aspect of building a robust science infrastructure. The work of small groups such as Sirius is vital in transforming the public perception of science and, along with the educational establishment, in training and preparing the next generation of scientists and engineers. Waiting for the ‘authorities’ to do all the work is of no use. It turns out that the success of similar groups actually relies on the work of very few individuals, who have learnt how to harvest local talent and how to tap into funding sources, either locally or internationally, individuals who have the willingness and perseverance to sacrifice their time and efforts for a surely worthwhile cause.